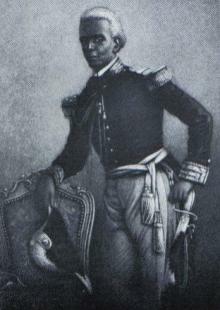 General Fabre-Nicholas Geffrard, President of Haiti from 1859 to 1867, was a member of the mulatto Catholic elite. He was eager to replace Vodou and signed the country's first concordat, making Catholicism the official religion. Haiti held fast and finally got its dioceses, but at a price. The main text of the concordat stipulates that the Government shall give the Haitian dioceses “a suitable annual allowance in excess of the usual state treasury funds”. This is not further specified and the details must be in the missing “Diplomatic Note” from the President of Haiti, Fabre Geffrard. According to Cardinal Antonelli, this “Diplomatic Note” amounted to an attempt “better to define the sense and full meaning of certain of the articles of the Agreement”. But the President's “Diplomatic Note” is not included in this version of the concordat, even though Cardinal Antonelli’s “Reply” to it is there and even though the Note was considered to be part of the concordat itself. And finally, in 1966 another amendment effectively suspended Articles 4 and 5 of this concordat, which allowed Dr. François Duvalier (Papa Doc) to nominate his own men as bishops and archbishops. However, both were reinstated after his death through the 1984 concordat. These Plenipotentiaries, having exchanged their full, respective powers, have concluded the following agreement. 1. The Apostolic Roman Catholic Religion, which is the religion of the great majority of the Haitian people, shall enjoy special protection together with its Missions in the Republic of Haiti, and shall enjoy the rights and powers, which are its very own. 2. The City of Port-au-Prince, capital of the Republic of Haiti, is promoted to the status of archbishopric. At the earliest possible time dioceses subsidiary to this metropolis shall be established, similar in nature to other archbishoprics and episcopates, should this be perceived to be necessary; and these shall be drawn up into administrative districts by the Holy See with the agreement of the Government of Haiti. 3. The Government of the Republic of Haiti undertakes to provide for and take care of archbishoprics and episcopates by way of a suitable annual allowance in excess of the usual state treasury funds. 4. The appointment of Archbishops and Bishops, whether diocesan or titular, falls under the exclusive jurisdiction of the Holy See. It is clearly understood that, should the occasion arise, all consultation shall be conducted with the greatest discretion. The same oath shall be taken by Vicars General, Parish Curates and Heads of Schools or Religious Institutions before the civil authorities appointed by the Head of State prior to them taking up their offices. 6. In the interest of a diocese an Archbishop or Bishop may, with the direct agreement of the President of Haiti and/or his Delegates, convoke an assembly of a suitable number of members in accordance with Canon Law provisions. 7. In large or small seminaries, which shall be established according to need, the regime, administration, and the teaching in such shall be ordered in accordance with Canon Law by the Archbishops and/or by Bishops, who shall freely appoint Father Superiors, Directors and Teachers of these establishments. 8. Archbishops and/or Bishops shall appoint their vicars general. In the event of a death or the dismissal of an Archbishop and/or diocesan Bishop, the diocese shall be administered by the Vicar General who shall be appointed as such; in the absence of such an appointment, this duty shall fall to the most senior in the office of the Vicar General; all other persons, should there be any, shall exercise their functions under the supervision of this Vicar, and he shall do so under the terms of their extraordinary powers granted for that purpose by the Holy See. This arrangement shall be valid until such time as there is a cathedral chapter established and as soon as a Vicar’s chapter shall be appointed in accordance with canon provisions. 9. Archbishops and Bishops shall appoint curates and parish vicars, as well as members of the chapter; and these appointments shall be made in accordance with canon law. The same shall examine letters of ordination, dimissorials, and the exeat [permission to leave], and also any other testimonial letters of foreign ecclesiastics who shall conduct their holy ministry within the Republic. 10. Archbishops and Bishops shall be free to exercise all that is within their pastoral assignment for their ministry within the tenets of Canon Law. 11. If, by dint of an alteration in profession, a change is made to the actual parish district, or should new ones be set up, Archbishops and Bishops shall provide for such changes henceforth by mutual agreement with the President of Haiti or his Delegates. 12. In the interest and to the spiritual advantage of the country, associations and religious establishments approved by the Church shall be set up. All these establishments shall be instituted by Archbishops and/or Bishops, which shall be subject to the approval of the President of Haiti and/or his Delegates. 13. No obstacles to free communication shall be placed between Bishops, Clerics and the faithful of Haiti and the Holy See in matters of religion and also equally between the archbishops and their diocesan clergy. 14. Curia funds shall not be employed in any parish except for the preservation of religious services and its ministries, and also for the maintenance and expenses of seminaries and other pious establishments. The administration of these funds shall be entrusted under the overall supervision of the Archbishop, or the diocesan Bishop, to parish curates and to the Director of the Council of Notables, who shall appoint a cashier from amongst the local citizens. 16. It is hereby declared on behalf of the President of Haiti and it is clearly understood on behalf of the Holy See that the carrying out of all that is stipulated in this Concordat cannot be hampered by any other provision set out in the law of the Republic of Haiti, and/or by any other contrary interpretation of the said law, or by contrary laws in force. 17. All points concerning matters ecclesiastical which have not been mentioned in this present Concordat, shall be regulated in accordance with current Church discipline approved by the Holy See. 18. The present Concordat shall be ratified by both parties and the exchange of ratified documents shall take place in Rome or Paris within the space of six months, or earlier if possible. The undersigned, Cardinal Secretary of State and Plenipotentiary of the Holy See, has the honour of notifying Your Excellency of the receipt of the diplomatic note through which He has sought better to define the sense and full meaning of certain of the articles of the Agreement concluded between the two plenipotentiaries for the purposes of reorganising and regulating the religious affairs of the Republic of Haiti. The aforesaid note, together with this present response from the undersigned, shall form part of the above-mentioned Agreement and should be regarded as having the same binding agreement and consequently shall be ratified equally between the two parties. Although Archbishops and Bishops, by exercising their pastoral ministry within the provisions of Canon Law, are subject to current Church discipline and approved by the Holy See, they shall never do anything to the detriment of the laws and functions of temporal authority: nevertheless the Undersigned accedes to the proposal of Your Excellency with respect to Articles 10 and 17; in full assurance that nothing is dearer to the heart of the Holy See than to see the two authorities proceed in complete accord within the limits of their respective functions and to conserve that perfect harmony which can only unite both parties in their mutual interest for good. It is agreed likewise that the appointment of Vicars General and Curates within the province of Archbishops and Bishops shall not fall to anyone beyond those persons acceptable to the President of Haiti. It is equally agreed that the terms Archbishoprics and Bishoprics, as used in Article 3, merely refer to titular persons of Archbishops’ and Bishops’ Sees; in the same way, the terms Vicar General and Vicar Capitular, mentioned in Article 8, shall administer the Diocese on the occasion of a death or dismissal of a titular person. The Undersigned also agrees to the declaration of Your Excellency with regard to a case in which anyone of the successors to the actual President of Haiti does not profess the Catholic Religion: along with this declaration it is agreed that, should the aforementioned case be proven, the present Concordat shall be modified regarding the rights to which a Catholic President lays claim, and which cannot be exercised by one who professes a different religion. The Undersigned, having satisfied the desires of Your Excellency in this way, expressed in the above-mentioned note, has the honour of renewing his sentiments of true respect.